1. Take the subway or get a transfer: Like most outings in New York City, the train provides the best means of transportation to and from. Terrible traffic and expensive parking can ruin your day before you even arrive at the USTA Billie Jean King National Tennis Center. Therefore, hop on the train and zip on over to the all the fun! 2. Enter through the South Gate: The East Gate entrance is closest to the subway and naturally is both long and slow, especially in the mornings. Take a short walk around the premises to the south gate of the grounds, which is generally much quicker and has shorter lines. 3. Plan your day to who you want to see: Check the daily schedule to find out who’s playing where and when. Pick the players you definitely want to see and get to their matches ahead of time, especially in general admission stadiums. Not only will this ensure that you get to see all your favorite players but it provides a more comfortable experience instead of running across the grounds to various stadiums to catch finales from the back row! 4. Record the action: While you will be restricted from bringing any serious filming equipment, you can certainly take advantage of your smartphone camera to snag some great pictures/video of the action to help you relive all the fun years down the road. Also, for those photography-inclined fans, be sure to bring your camera and get some great action shots of the players (and of yourself too!). 5. Come early if you’ve got a backpack: U.S. Open lines can be quite lengthy, especially for those bringing bags inside. Separate bag holders’ lines move at a snail’s pace as security checks each bag thoroughly. While it may be wiser to simply leave the bag at home, if you must bring one, do try to arrive early and avoid this entrance delay. 6. Get lanyards for your tickets: Lanyards worn around your neck is the easiest and most efficient way to hold tickets. Not only will it prevent pickpockets from ruining your day by snagging your tickets, but it’s also much more convenient when entering the proper section for your seats, especially if you’re carrying concessions items. 7. Dress with the weather in mind: Check the weather forecast! If it’s calling for rain, bring an umbrella or poncho. Most days, however, are hot and sunny (it is August!). Therefore, prepare accordingly with sunscreen, comfortable clothes and shoes, sunglasses, and a hat! 8. Know the fan etiquette: Be seated before any match begins. No one likes a guy walking across their view when a key serve or volley commences! Try to include bathroom breaks with concessions to avoid incessant walking to and from your seat. Know your designated seat. Ushers will help you find your spot if you need help, but don’t try to sneak into sections that you aren’t authorized in. Trust me, tennis security will prevent you! Don’t talk during gameplay. Know when to cheer. It’s usually reserved for following a great serve or breakpoint, etc. 9. Standing ovations are typically reserved for the end of the match: There is no need to stand up and cheer wildly during any point during the match. Show your greatest appreciation for after the match is over. 10. If it rains: If the match hasn’t gone 90 minutes, you can usually get a refund or credit towards next year’s tournament. However, it depends on the ticket supplier you used. Always check for details about rain match suspensions. Bonus tip: If you are in a rather empty section during an under-attended U.S. Open match, feel free to move up closer to the action. However, be considerate if the proper seat owner appears and don’t try to move up into other premium sections; the ushers will most definitely catch you. 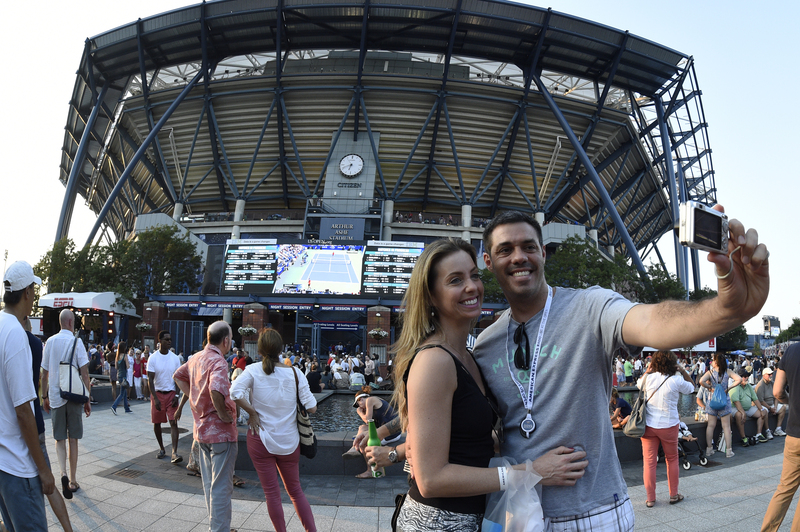 For information on tickets to the 2018 U.S. Open, visit Championship Tennis Tours at TennisTours.com.